Yes it's in a plastic bag. 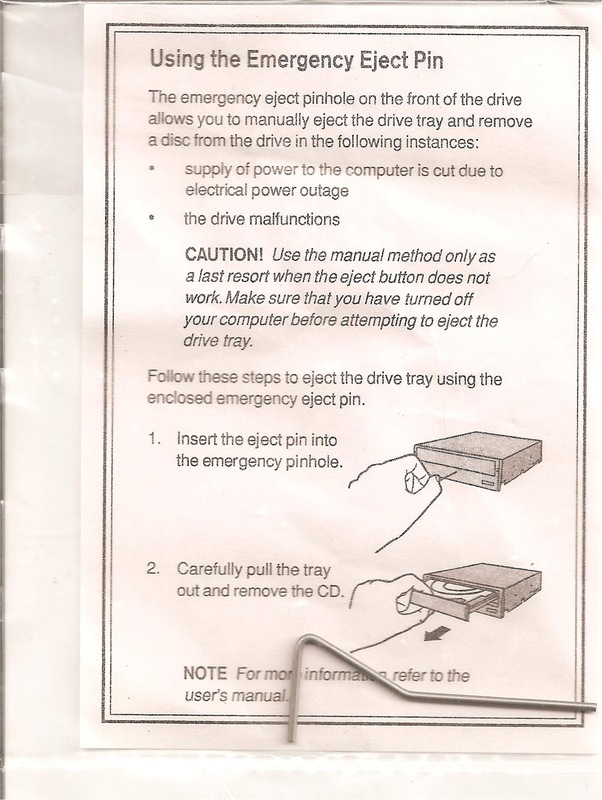 Some time ago, and my "some time" I mean years, I made a blog post about analog CD extraction devices. It was neither rioting or ground breaking, but it was one of my more commented posts. Looking back I see the images no longer work (and I have a flicker account?). I'll get that fixed sometime. 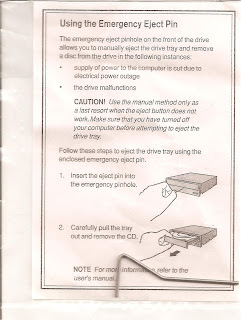 Recently I discovered an Emergency Eject Pin (pictured), clearly a knock of off the more clever Analog CD Extraction Device. Admittedly it may be time to change the name, before the cloud and streaming media makes optical discs obsolete. I'm thinking Analog Optical Disc Extraction Tool. Analog for all the obvious reasons. It could be dropped all together, but come on that makes the whole thing work. Optical Disc so it can apply to a broader range of whatever happens to be a disc shape. The change to "Tool" over "Device" was a difficult decision, but I think it better illustrates functionality. Wikipedia tells me a device and tool are pretty much the same thing, but personally I think of tools as simple objects like screw drivers and pliers. Where a device would be something designed for a specific task like a cable tester.